The Sonos Multi-Room Music System is a modular set of digital appliances that works with end-user supplied or built-in speakers to form a zoned audio system in which different zones may play the same or different audio. Experience 2D or 3D in breathtaking full HD. Whether you are viewing premium quality 2D picture or seeing and hearing incredible 3D depth, Samsung products heighten your viewing experience. Founded in 1979, Boston Acoustics, Inc. designs, manufactures, and markets high-performance audio systems for home audio/video systems, after-market and OEM automotive systems, and custom-installations. We all know how to turn a house into a home. But how do you turn a home into a home theater? It starts with the right equipment. Engineered to the highest standards. And designed to reproduce the sounds, sights and experiences in a way that would make the original artist proud. Turn your home theater into something special. You may never want to leave the house again. SnapAV is the vision of Jay Faison, himself a former Custom A/V professional and the owner of a custom integration business in Charlotte, NC. In 2005, Jay wasn’t happy with the crop of suppliers he had to choose from. He had an idea for a different kind of supplier, built from the ground up to serve businesses like his. So he started SnapAV. The Jamo® brand—owned by Klipsch Group, Inc.—bases all of its audio products, speakers and electronics alike, on the Danish design tradition of style, simplicity and functionality. For Jamo, it’s not just about delivering great sound; it’s about how a product integrates into a living space. 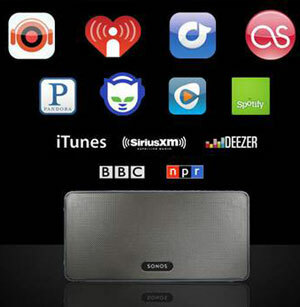 Soundcast is about making it easy to listen to your music any time, any place. Have you tried other wireless audio products? We tried them all and couldn’t find any that actually worked properly or sounded good. They were filled with pops, crackles, and dropouts. Soundcast was born out of this frustration. Through blood, sweat and tears (and also a bit of brain power), we’ve solved the challenges others couldn’t. Finally wireless audio products that really work, are easy to use, and sound awesome. Panasonic Full HD 3D Step into the 3D World™ with a VIERA® VT series Full HD 3D Plasma HDTV, 3D Blu-ray Disc® Player and 3D Eyewear. ELAN Home Systems has manufactured innovative multi-room audio/video systems since 1989. Our systems were the first to integrate music, intercom and television distribution features that used the homeowner’s stereos, televisions and telephones to create the entire home entertainment experience.